Your 1st look at the HG's INSIDE THE BB HOUSE!!! Also, TODAY IS THE LAST DAY to get the live feeds Early Bird Special!!! You have, literally, hours before this deal is gone for the whole season, so hurry & get those feeds and save yourself money!! I still have a lot to do before BB10 starts tomorrow, but I can't WAIT until BB starts! Early Show w/ Julie Chen: Full House Tour!! As mentioned, this morning Julie Chen and Allison Grodner showed the Big Brother House in a full house tour!! The video is just over 3 minutes long, which is longer than the "teaser video" CBS leaked out a few days ago. And just a reminder, the Early Bird Special for the live feeds ends TOMORROW NIGHT!!!! If you know for sure you will be getting the feeds this season, then hurry up and snag this great deal up!!! You get 2 weeks totally free, then $12.99.month (orig. $14.99/month), so save some money this season on the feeds and sign up now!! Okay everyone, we have only a short 2 DAYS LEFT before BB10 begins!!!! :-D I have a ton of stuff to do in order to prepare for this season, but I will be posting throughout the day, so keep checking back!!! Oh, and don't forget to BOOKMARK THE BLOG!! So look through the interviews on CBS's YouTube channel and pick the HG's you think will make it all the way to end! So, how do you enter? Well, that's easy as pie, too! The blog needs *your* help this season (more than ever!) to stay alive! So I incorporated the need for support for the blog with an idea for a contest with a SWEET PRIZE!! 1.) Choose a HG you think will make it to the end! 3.) In the description part of the donation, type the name of your HG. 5.) The drawing will be 1 hour before the season Finale! The Winner Will Receive $100.00!!!! Ok, so the houseguests moved into the BB house yesterday (Weds), an HOH has already been crowned (see above link to find out who), half the house is already on slop, Renny is annoying the HG's, Jessie & Memphis are buddies, and to avoid drama, the new HOH wants to draw names out of a hat for nominations (smart move!). So there ya have it, up to the minute news about what's going on in the BB house!! If you want to see all the HG's interview videos, head on over to CBS's YouTube Channel! Personally, I love Jerry and I'm loving Renny's wild-ways. They ALL seem like they're gonna be a force to be reckoned with, though!!! I have VERY high hopes for this season of Big Brother!!! There's only 3 more days until BB airs on CBS, which means that there is 2 more days to get the live feeds "Early Bird Special"!!! Still don't have the live feeds yet? Get them now at a discount price PLUS 2 Weeks Totally Free!!!! Some of my favorite things on the live feeds is (of course) the naughty stuff, but also seeing friendships forming, chemistry between two people building up, tension rising & eventually exploding into a good fight, and then all the other little misc. things that are hilarious to watch, such as people dancing, farting, tripping over things, flashing the cameras, having convos with us feed viewers via the cameras in the house, and the list goes on and on! But, my ABSOULTE FAVCORITE REASON for getting the feeds is....*drumroll please! *....listening & watching the HG's scheme, plot, plan and manipulate the other HG's!!!!! That is something that happens on a daily basis (sometimes hourly! lol) and it's always highly entertaining!! Is it just me, or is this week going by soooo sloowwwwwww?! ARGHH!!!! Alright BB10 Blog fans, that's it for now but keep checking back to see what's going on in the BB house! Also, there are 14 spaces on the Memory Wall (where the pics of the HG's go). What does that mean? Who knows! Afterall, it is big brother: "Expect the Unexpected"..always! Remember, the full house tour with Julie Chen will be on Friday on The Early Show!! I didn't make the official announcement, but I have mentioned in previous posts, that Big Brother: After Dark on Showtime will be returning again this year! I personally love watching BB After Dark because I get to lounge on my couch and snack away on some popcorn, instead of being a slave to computer. :-P BB After Dark on Showtime starts on July 13th (the same day that Big Brother 10 starts on CBS) at 12am EST. I've been getting SOOOO many emails and comments about if I got married yet, how did it go, etc etc. I was REALLY surprised at you fans remembering AND caring enough to ask! Yes, I am a married woman now! :-D w00t w00t! We got married 2 1/2 weeks ago (June 20th) and we had a great wedding! I uploaded 20 pictures to the blog's myspace page (click the Myspace button on the right side of the blog). Thank you to those how have sent congrats and their warmest wishes!! Alright ladies & gents, that's it for now! There's nothing more to report today, just a friendly reminder that this Friday on CBS, Julie Chen gives a FULL tour of the house (the video you saw was just a teaser). I've been hearing rumors of "secret rooms" in the house this season, but of course, has not been confirmed. We shall see on Friday! If you don't catch the Early Show to see the house tour, don't worry, I'll post the video here on the blog! Video of all 13 Big Brother 10 Houseguests! Okay, let me go look for some other vids & info for ya'll!! Oh, and if you would like to help stock my pantry with coffee & snacks, I'd be EVER SO GREATFUL!!! :-D You can do this by donating a buck or two through the "Donate" button on the left!! I LOVE the kitchen, love the outside, LOVE the new HOH room, I'm "diggin" the 70's room, and what a blast from the past is the 80's room! OMG, I love the whole house!! Meet all 13 of the Big Brother 10 Houseguests!! Also, the pics of the BB10 cast and their bios are up on CBS.com!! Go check'em out! I'll be doing alot of posting today, so keep checking back! BB10 is now only 5 DAYS AWAY! w00t w00t! Meet 7 of the 13 BB10 houseguests!!!!! While sitting aroud wishly hoping/waiting for CBS.com to reveal the pictures of the houseguests for BB10, I stumbled onto 2 videos (I compiled them into 1 vid for ya'll) that introduce 7 of the 13 houseguests!!! And guess what, that rumored list I posted, IT'S REAL!!!!!!!!!!!!!! BB lovers, get crazy happy & meet 7 of the confirmed houseguests!! More details to come! You know what to do..
BB10 Blog presents...Calendar of Events! Mon July 7th: CBS.com is rumored to release cast pics! Sat July 12th: Last Chance to get Live Feeds Early Bird Special! 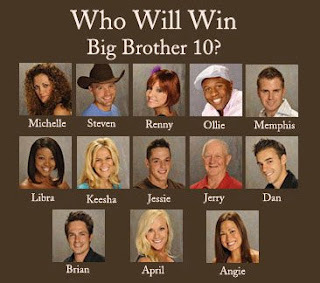 I will be checking CBS.com tonight to see if the cast pics of Big Brother 10 has been posted, and if they are, I will post the pics right here!! If you haven't yet bookmarked this blog, go ahead and do so! 6 days and counting! Are you ready to be addicted?